Early Edition enthusiastically invited Theodore Deacon to share some thoughts on this week’s production of Henry Purcell’s Indian Queen, a collaboration of Seattle Early Dance, Baroque Northwest and Early Music Guild. Performances are on February 25, 26, and 27 at 7:30 PM at the Chapel at the Good Shepherd Center. More information about the performances and online ticket purchasing can be found here. Well, not quite. 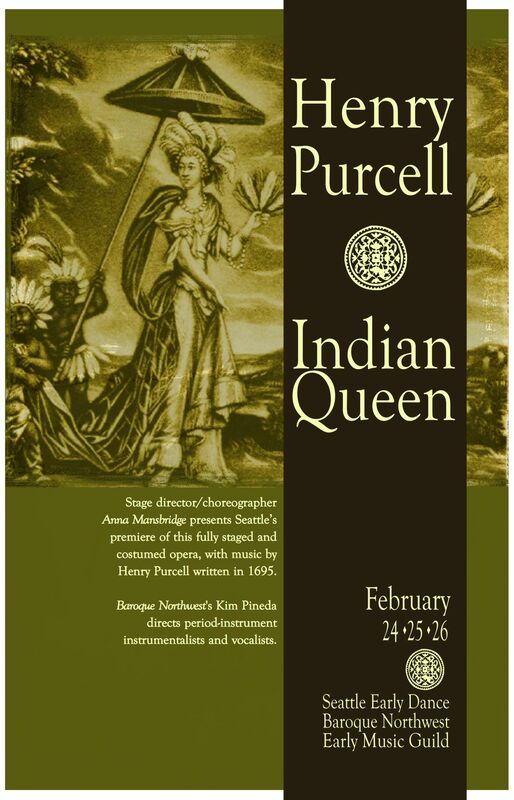 I have been working on Henry Purcell’s ‘The INDIAN Queen’ for nearly a year now. My dear friend and choreographer Anna Mansbridge first wanted to do the composer’s “Fairy Queen,” but after mulling it over, I convinced her the length and size of the whole package would be a bit beyond our means at this time. You would have to mount a production of Shakespeare’s “A Midsummer Night’s Dream” to really do it well (making for, at least, a five hour extravaganza). And then there’s the large cast and orchestra. Not an easy fit for the quaint chapel environment of the Good Shepherd Center. “King Arthur,” though more of a semi-opera, has a clunky plot and demands a chunky orchestra. So, “Indian Queen” it is. Yet, beside its two hit tunes, “I attempt from love’s sickness” and “We the spirits of the air,” few (like my coffee cohort) know the entire score or have seen a full production. Not surprising. “IQ” – as we charmingly refer to it – was Purcell’s incidental music to a Restoration Tragedy by John Dryden, and if you know anything about the celebrated Mr. Dryden or the plays he produced you know there are problems to face. Like most Restoration tragedies, IQ has an immense cast of characters and a high body count by the time the curtain falls. And then there are those interminable ranks of “heroic couplets” that Mr. D was all too fond of. (Ta da, ta da, ta da, ta da, ta da – rhyme: repeat, ad nauseam.) We are looking at serious hours of silly plot and poetic tedium to get to the musical gold. The solution? Bag Dryden and start from scratch. Well, not exactly scratch. I took the plot mostly from the last act of Rameau’s delightful opera “Les Indes Galantes” where the theme of “who knows best the ways of love” is endearingly batted about by a slightly goofy pair of Spaniard and Frenchman. The prize? The noble and beautiful Aztec Queen Zempoalla who must choose wisely to ward off war. And to whom will she grant her affections? You’ll have to come to the show and find out. You will be rewarded with an exquisite array of Purcellean songs, rousing trumpet tunes and elegant courtly dances. But then you will also will have to put up with my faux-Restoration couplets, though far far fewer than the prolix Dryden … and there’s a happy ending (and negligible body count) this time. Well, I’m devastated to have discovered this production too late to get tickets! I would love to have seen it, and was fully prepared to drive 6 hours from Vancouver BC to do so. Any chance you’ll remount? It sounds like you have an adoring audience with two sold out nights! Perhaps there will be more Seattletonians (?) who will also be gnawing their fingers to get a ticket for another showing. I know there will be other Vancouverites who would also love to come with a bit more forewarning. In the meantime, bravo for your success, and merde and toi, toi, toi for the two showings tonight and Saturday night. Click here to learn more about staying in tune with our blog updates! Anonymous 4 performs this Saturday, April 30 at 8PM, Town Hall.